Abraham Lincoln spent 14 of his most formative years-from age 7 to 21-in Southern Indiana. Today, Indiana's Lincoln attractions include his boyhood home and some of the most extensive collections found anywhere in the world. In addition, communities statewide are planning special bicentennial events and projects. In the fall of 1816, Thomas and Nancy Lincoln packed their belongings and their two children, Sarah, 9, and Abraham, 7, and left their Kentucky home bound for the new frontier of southern Indiana. Arriving at his 160-acre claim near the Little Pigeon Creek in December, Thomas quickly set about building a cabin for his family and carving a new life out of the largely unsettled wilderness. In time, he cleared the fields, improved the cabin and outbuildings, and utilized his carpentry skills to establish himself within the community. In much of the work his young and capable son assisted Thomas. As he grew older, Abraham increased in his skill with the plow and, especially, the axe. In fact, in later life he described how he “…was almost constantly handling that most useful instrument…” to combat the “…trees and bogs and grubs…” of the “unbroken wilderness” that was Indiana in the early 19 th century. Sadly, Thomas and Abraham whipsawed logs into planks, and with wooden pegs, they fastened the boards together into a coffin for the beloved with and mother. She was buried on a wooded hill south of the cabin. The family keenly felt Nancy 's absence as young Sarah and Abraham were now without a mother and Thomas without a wife. This loneliness led Thomas in 1819 to return to Kentucky in search of a new wife. He found her in Sarah Bush Johnston, a widow with three children. Thomas chose well for the cheerful and orderly Sarah proved to be a kind stepmother who reared Abraham and Sarah as her own. Under her guidance, the two families became one. 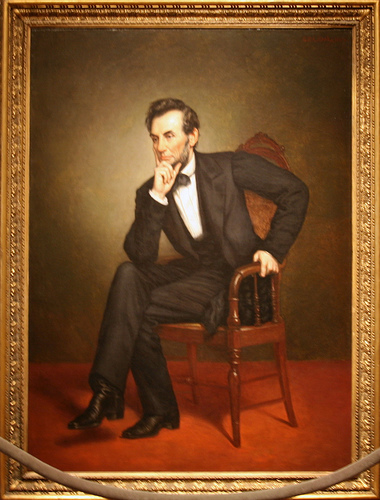 The remainder of his years in Indiana were adventurous ones for Abraham Lincoln . He continued to grow and by the time he was 19, he stood six foot four. He could wrestle with the best and local people remembered that he could lift more weight and drive an axe deeper than any man around. In 1828, he was hired by James Gentry, the richest man in the community, to accompany his son Allen to New Orleans in a flatboat loaded with produce. While there, Lincoln witnessed a slave auction on the docks. It was a sight that greatly disturbed him and the impression it made was a strong and lasting one.